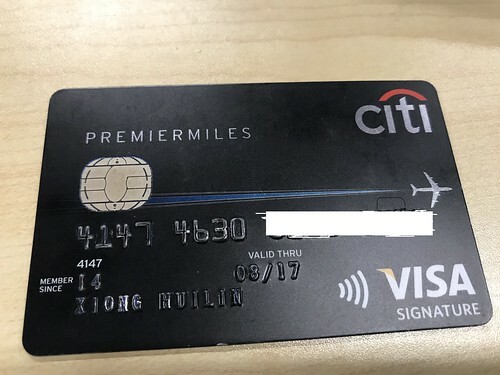 Test the Open Smart Card Shell on “doemv.js” on credit card for the EMV SDA function, get into the detail to understand the EMV SDA procedure steps. 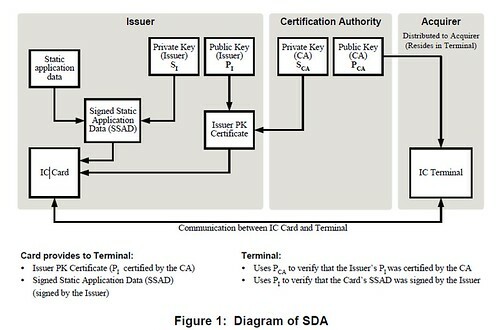 The Certification Authority Public Key (PCA) is stored in the IC Terminal. PCA will be used to decrypt Issuer PK Certificate, and to extracts the P1 key (Issuer Public Key). P1 key will be used to decrypt the SSAD (Signed Static Application Data). Refer to below EMV v4.3 Book 2 – EMVCo SDA flow (Chapter 5: 5 Static Data Authentication (SDA) page 51). 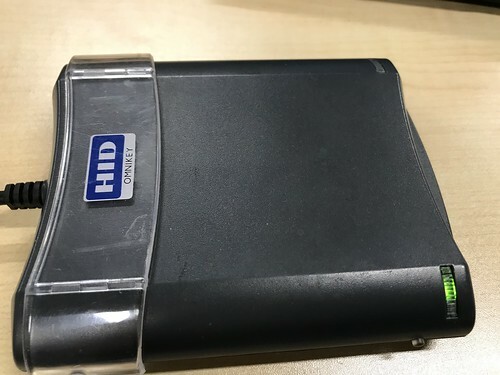 I tested with below reader and expired credit card. 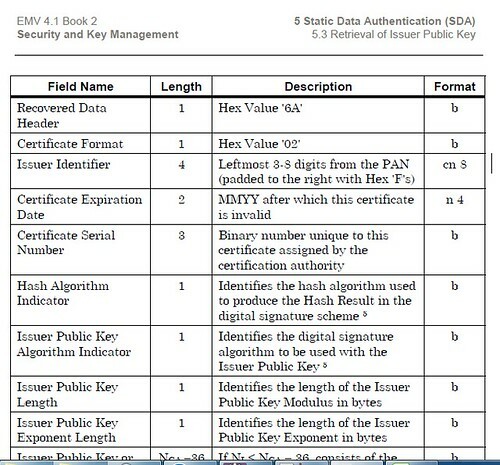 Then read the Certification Authority Public Key Index from the ICC, the index can be read out through tag 8F (Certification Authority Public Key Index). In the test, the index is 0x08. It indicates below CA. Decrypt the Issuer PK Certificate with CA to get issuer public key, both Issuer PK Certificate and CA should be the same length, in the test, the length is 176 bytes. Issuer PK Certificate with CA can be retrieved from tag 90. Also need the Issuer Public Key Remainder, it can be retrieved from tag 92. Refer to below EMV v4.3 Book 2 – EMVCo SDA flow (5.3 Retrieval of Issuer Public Key page 59). Use SHA-1 Hash to calculate the hash result. Issuer Public Key Modulus is Issuer Public Key + Issuer Public Key Remainder. Decrypt the Signed Application Data (SSAD) by using the Issuer Public Key Modulus retrieved from above steps. 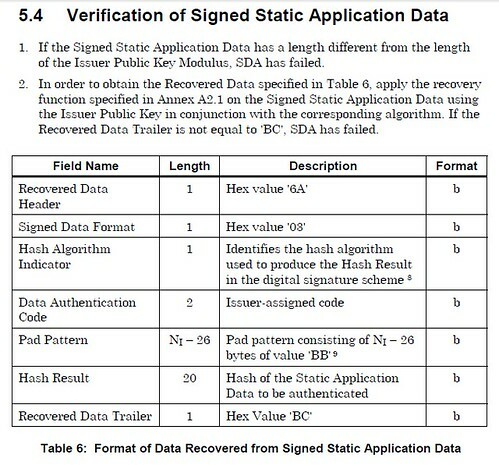 The SSAD (Signed Static Application Data) is retrieved from tag 93. Another input is Static Data. It is the data to be authenticated, for the test, it includes the Application Primary Account Number (PAN) and Application Expiration Date. It reads 5A0841474630XXXXXXXX5F2403170831. Static Data also includes the Static Data Authentication Tag List (Tag 9F4A), here the value is 0x82. 0x82 value was read through GET PROCESSING OPTIONS Command (80A8), first two bytes is Application Interchange Profile (AIP), tag 0x82, value here is 7C00. After decryption, go through 7 steps to verify the SSAD. Refer to below EMV v4.3 Book 2 – EMVCo SDA flow (5.4 Verification of Signed Static Application Data, page 61).